Chicken Pot Pie Soup in 30 Minutes - Chicken Pot Pie Soup is the best of both worlds, with all of your favorite pot pie flavors cooked into a simple one pot soup that goes from prep to plate in just 30 minutes. 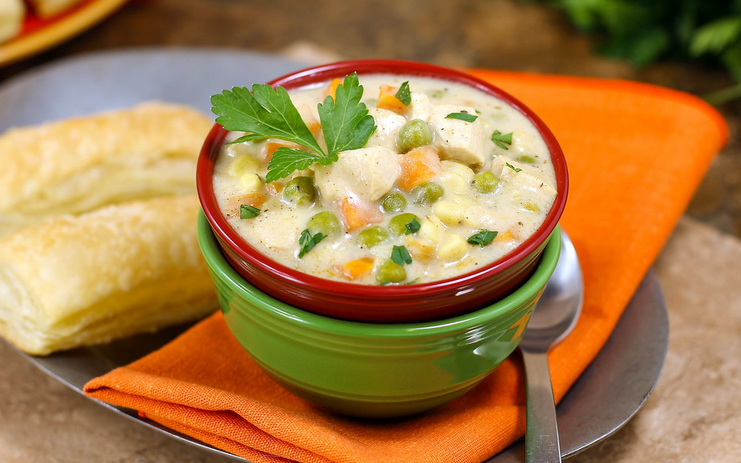 A rich and creamy soup packed with chicken, vegetables and enough flavor to make your mouth sing! Comfort from your lips to your toes in half an hour. Spoon please. Head over to Community Table for this incredibly easy delicious soup your whole family will love. I love dinner recipes that come together in 30 minutes. Say hello to BBQ Chicken Pizza Soup. 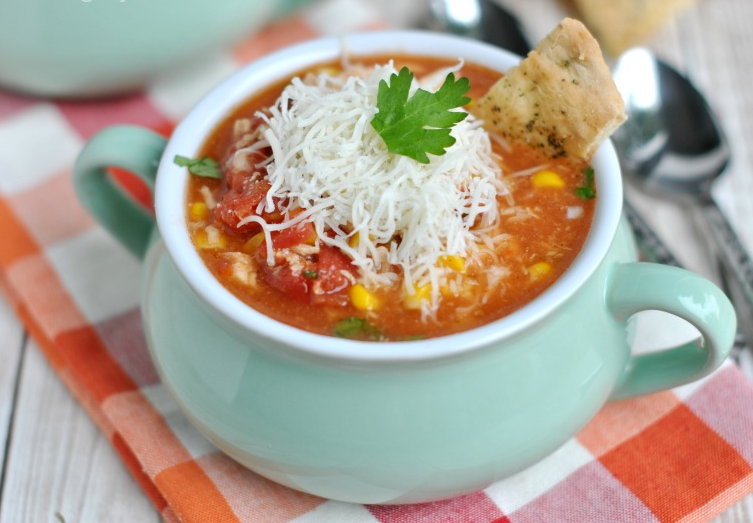 We made some Pizza Crust dippers to go with this delicious, hearty soup too! While the soup simmers on the stove top, you can get to work making the easy pizza crust! I used a pouch of Betty Crocker Pizza Crust mix and 1/2 cup water. Combine until it forms a dough, then using the palm of your hand, press it onto a 15 inch round pizza pan (you’ll want the dough to be about 12 inches around). You can also use a package of Pillsbury refrigerated pizza dough (it will roll out into a rectangle, that works too). Once you’ve got your dough pressed, drizzle some olive oil on top and add your seasonings. Bake and cut into bites! This soup is going to be a go-to recipe on those hectic weeknights this winter! Head to Community Table for this recipe! Nothing takes the chill off a cold night like a bowl of your favorite soup. Just the thought of this fully loaded cheesy baked potato soup is enough to make my heart skip a beat. I can’t get enough of it. This is a very simple soup made with left over baked potatoes (or cook your own in the microwave in just minutes). 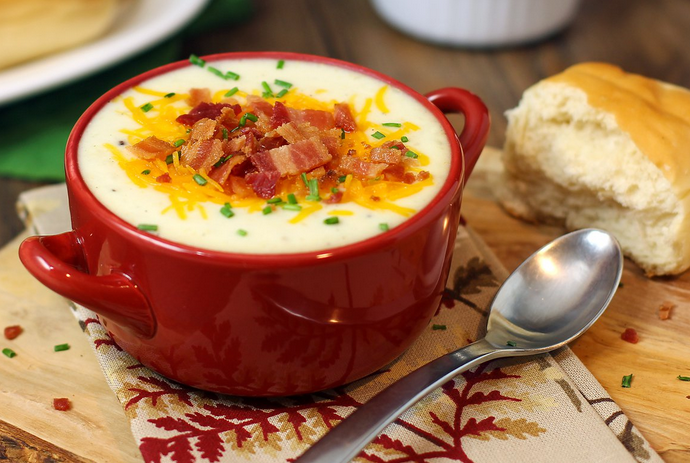 Tender chunks of baked potato in a rich cheese soup are garnished with cheddar cheese, bacon crumbles and chives. With white cheddar, mild cheddar and cream cheese this is surely the cheesiest baked potato soup you will ever sink you teeth into. Head to Community Table for this recipe! 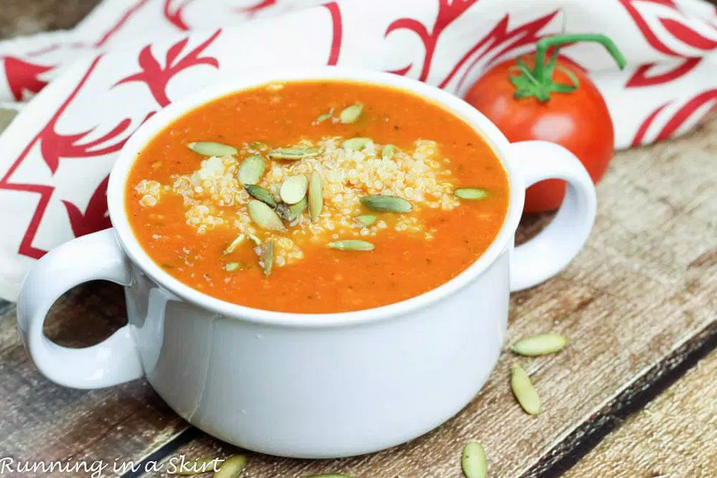 This 30 Minute Tomato Quinoa Soup is an irresistible vegetarian or vegan meal! It’s full on soup season in my house. I’m a big fan of making easy and delicious homemade soup this time of year. It reheats well, is packed with healthy clean food and is usually really easy to make. This 30 Minute Tomato Quinoa Soup is no exception. Sure, you can bust out a can of soup… but would it look and taste like this? Not to mention you don’t control the ingredients that way! The quinoa is an easy addition that makes the soup alone a balanced meal. Including everything there are only ten ingredients in this soup, so it can be on your table in a snap. If you have more time, let it simmer on the stove for even more flavor. Head to Running in a Skirt for this recipe! 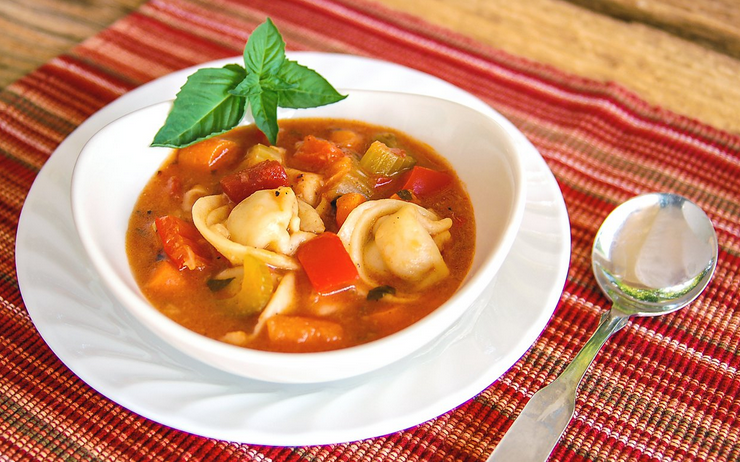 Tortellini and vegetable soup is a fantastic hearty vegetarian meal with Italian pizzazz. With fire roasted tomatoes that bring in an added dimension of flavor, this pasta and veggie soup is a perfectly satisfying meal. I created this soup to have just enough pasta to beat those cravings and more than enough veggies to make me feel good about serving it to my family. Not to mention, going meatless at least once a week has been said to have health benefits. Now that fall is in the air, it’s time for soup to be on the stove. With only 30 minutes from prep to plate this is sure to be on yours quite often – even on weeknights. Head to Community Table for this recipe! This easy Sweet Potato Soup is blended in just a matter of minutes so that you can whip it up in a flash. So if you are in the mood for some cozy soup, but do not feel like spending hours slow-simmering some stew, make this! 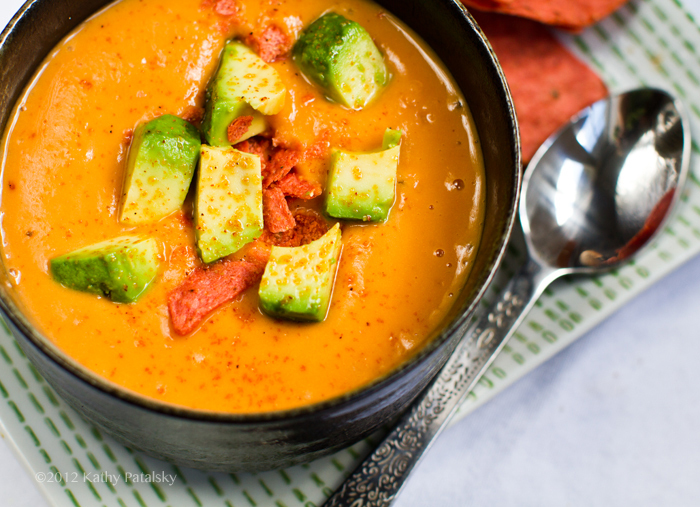 It is made special by serving with some silky cubes of avocado on top. Crumbled jalapeno corn chips too. I season it with my favorite spices and accents like chipotle and citrus. And this healthy blend is loaded with vitamin A! I loved this soup so much that I enjoyed the sweet potato version for lunch and whipped up a canned pumpkin version at dinnertime. Broth. I used Imagine Foods vegan No-Chicken Broth for my soups. It has a very savory veggie flavor that I love. I bought it at Whole Foods. It is like "vegan chicken broth." But vegetable broth is perfect to substitute if needed. I know it is easier to find! Head to Lunch Box Brunch for this great recipe. 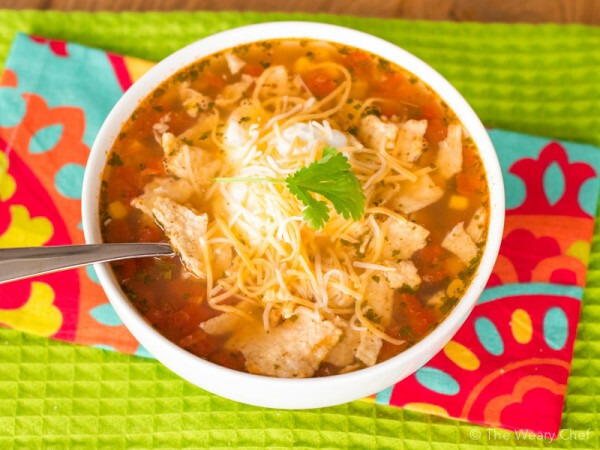 Easy Mexican Chicken Soup- This tasty chicken tortilla soup could be made in as little as 10 minutes if you have cooked chicken on hand. Perfect weeknight dinner! I needed to make something delicious and foolproof to boost my confidence. This Mexican Chicken Soup is IT. You can not mess this up. I really can’t think of a way (don’t challenge me on that). It is so tasty, easy, quick, and all the other adjectives I love when I’m talking about a dinner recipe. Whether you need to feel like a rock star in the kitchen or just want a no-brainer recipe after a long day, make this soup! Head to Weary Chef for this amazing soup recipe! Have you ever loved a dish so much that you want to eat it every day? Everyone who knows me can attest to my favorite dishes: baked ziti and lasagna. I can eat them everyday and never tire of them. Delicious cheese and sauce with pasta and meat sends me over the moon. So with a desire for my favorite lasagna and a craving for a fabulous soup, I have combined the two ideas to come up with the best soup ever! Seriously, my picky family sat down to eat this soup with a little bit of trepidation. Two and three bowls later (each) we decided it was the best thing since sliced bread. 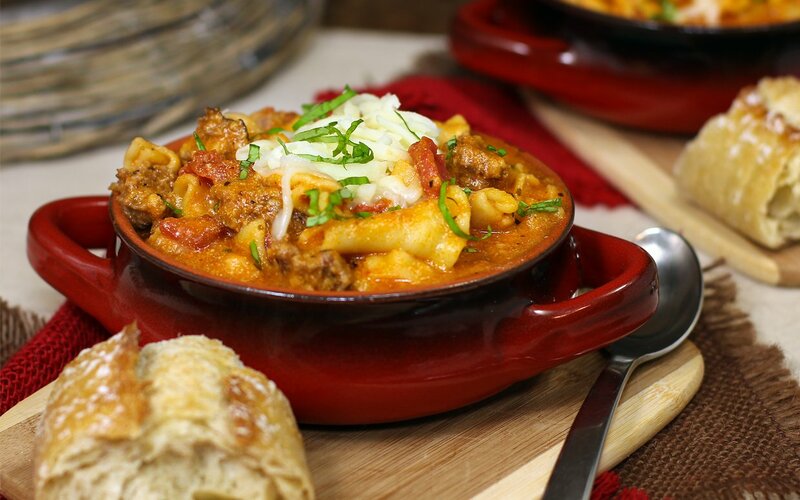 Ultimate Three-Cheese Lasagna Soup is loaded with sausage, pasta, tomatoes and three scrumptious cheeses: ricotta, Parmesan and mozzarella. Head to Community Table for this delicious recipe.